How do I link tickets to feedback items? In order to effectively manage feedback requests, sometimes it can be useful to link tickets to feedback. This can be very useful when managing feature requests or keeping tabs on which tickets are related to which feedback items, allowing you to manage user communications with ease. 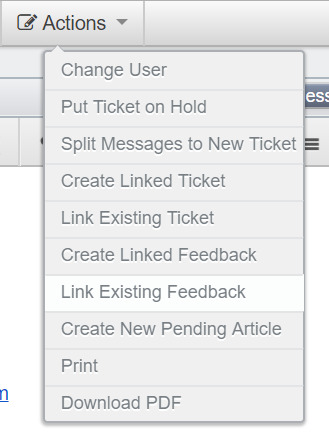 To link to feedback from a ticket, the "Link Existing Feedback" and "Create Linked Feedback" options are available from the Actions menu in the ticket view. "Link Existing Feedback" displays a search box where you can enter feedback title or an ID to find the feedback item you want to link the ticket to. "Create Linked Feedback" opens the New Feedback tab. The New Feedback shows a message at the top saying it's being created as a linked item to the ticket. After a ticket has been linked to feedback, a "Linked Feedback" tab is added to the ticket Properties box. This simply lists the linked feedback with an "x" icon to remove the link.